Note: I wrote this review as part of Silver Screen Serenade’s Resolutions series, which is why it has a different format from most of my reviews. Silver Screen Serenade is a fantastic blog, run by the witty and perceptive Cara. If you haven’t visited her site, you seriously should. Time for a confession: I have never before enjoyed a Stanley Kubrick movie, at least not in its entirety. I recognize the sheer brilliance of Full Metal Jacket (1987) and A Clockwork Orange (1971). I see the powerful symbolism and horror in The Shining (1980), and I even acknowledge the psychological resonance of Eyes Wide Shut (1999), but I do not like any of them. Nor do I see any reason to repeat the viewing experiences. So it is I came to 2001: A Space Odyssey expecting to dislike (but still appreciate) it. Plus, I had been repeatedly warned that 2001 does not develop characters, does not tap emotion, is incredibly slow and has a confusing ending. I figured I would finish this film appreciating Kubrick’s artistic and intellectual genius, but having no desire to ever again see his outer space masterpiece. Was my expectation fulfilled? No. This is one of my favorite movies of all time, so much so that I have already watched it twice. But let’s get more descriptive by starting with the visuals. This film was finished in 1968 and started at least two years before that, but the effects still work, even forty-five years later. Sure, many of them are not as realistic as what we see in modern movies (Gravity anyone?) and sure the modern world has nothing like grip shoes, but that barely matters. Kubrick and his effects gurus produce stunningly beautiful visuals that still resonate, that still strike us with their extraordinary allure. Second, the sound. Stretches of this film are totally silent, including every time someone is navigating outer space. Kubrick thereby creates discomfort in his audience, the same uneasiness astronauts must feel when space walking. After all, even when we think we’re sitting in silence, we are tuning out ambient noise, which means true, absolute vacuum silence is disorienting, and Kubrick knows it so uses it. Third, the classical music soundtrack. 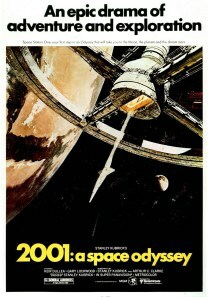 Kubrick commissioned an original score for 2001, and initially used classical music as filler during editing. Somewhere along the line, he realized how effective it is and discarded the score. Which is why the soundtrack illustrates this classic’s brilliance. Every element is perfectly used to create proper mystery and intrigue. Speaking of mystery: that is also awesome. The monolith connects 2001’s plot, and always keeps us interested, even when it’s off screen for long stretches. The plot. It is not complex, but it is engaging. The pace. 2001 is slowly paced, as I had been warned, but somehow it doesn’t feel slow. This film is long, but it is still immersive. The performances. They are all note-perfect, even if none of them stand out. Well. That’s not entirely true. Douglas Rain’s voice acting as HAL-9000 is the best I have ever heard in any film, be it live action or animated. If ever a voice actor deserved an Oscar, it is Rain. The symbolism, philosophy and allegory. 2001: A Space Odyssey is the best intellectual movie I’ve ever seen. It doesn’t bother with characters or emotion, really, but it doesn’t need to because it is so . . . confoundingly brilliant. Anyone can have theories as to what this means, but it can also mean something different to everyone. The symphony. Because that’s what 2001: A Space Odyssey is . . . a visualized symphony. There is nothing about this movie I dislike. Even the lack of female or minority presence is not a flaw, not here. A Worthy Resolution? Well. Yes. 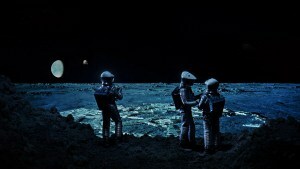 2001: A Space Odyssey is perfect. I guess that means it’s worthwhile viewing. Reading your review makes me want to watch 2001 again. A visualised symphony is an apt description, the classical music works so well with the images. Great points all around. Nice review. I share a lot of your feelings about Kubrick. While I see what people about him, most of his films are not ones I want to see over and over again. However, 2001 has alwasy been the execption. That said I have a slightly different relationship with it as I first saw it many years ago during the middle of the night while I was ‘standing watch’ over a dieing relative in hospital. As you could imagine the film’s final scenes, watched in an emotional sleep deprived state, had a powerful impact. Equally that was my third attempt at watching it as I had previously been put off by the Ape scenes. If you’ve not already see it I would suggest seeking out 2010. While very different visually (nowhere near as impressive) I would argue that the story is far better (being based on the best of the four Odyssey books). I can imagine those last scenes being pretty heartbreaking in that context.